I don’t understand but I won’t make a scene. Fresh eyes and ears see (and hear) what flies under local radar. One of the quiet joys of a mobile life is observing little local eccentricities, especially in vernacular. Australia as we know it is but a young country and culturally pretty homogenous. But even though we don’t have those charming little local dialects celebrated in other countries, we’re not all the same. The Berra has its own special expressions, and my visiting friend and colleague James gleefully pointed out his two favourites this week. Usually teamed with a locality, we can’t think of another place in Australia that uses this phrase in quite the same way. 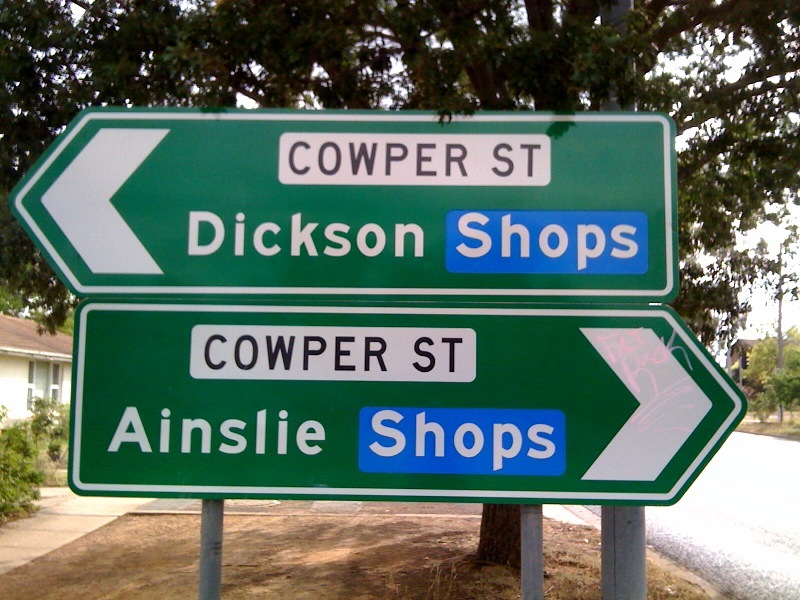 Sentences like “I’ll meet you at the Ainslie Shops”, or “There’s a great new restaurant at the Griffith Shops” are standard in the Berra, but make out-of-towners giggle. They’d never say, “Meet you at the Redfern Shops”, and not just because they don’t have adequate body armour to undertake the excursion. Those are James’s observations. I reckon there are some other very local Berran phrases, the use of which can render you almost instantly local(ish). Everyone in the Berra lives in one of these two locations, determined by your relation to Lake Burley Griffin. Not ‘north’, nor ‘south’; these are words for general directions, or incomplete descriptions used by stupid out-of-towners. Short for ‘government’, and used especially to describe the origins of one’s housing. When the Berra was under construction, the government apparently built a lot of little cottages to house the newly arriving public servants, and these form a lot of the housing stock in the Berra’s older suburbs today. You’ll hear young, newly-propertied couples at cafes discussing their shiny new mortgages by saying, “Yes, we’ve just bought in Bruce; it’s a little ex-govvie”. At just over 18 months on the ground, I’m still far from local. Any suggestions for further Berran phrases I could learn will be gratefully received.